Charles William Sharpe; 1818-1899, printmaker. Daniel Maclise; 1806-1870, Irish painter artist. 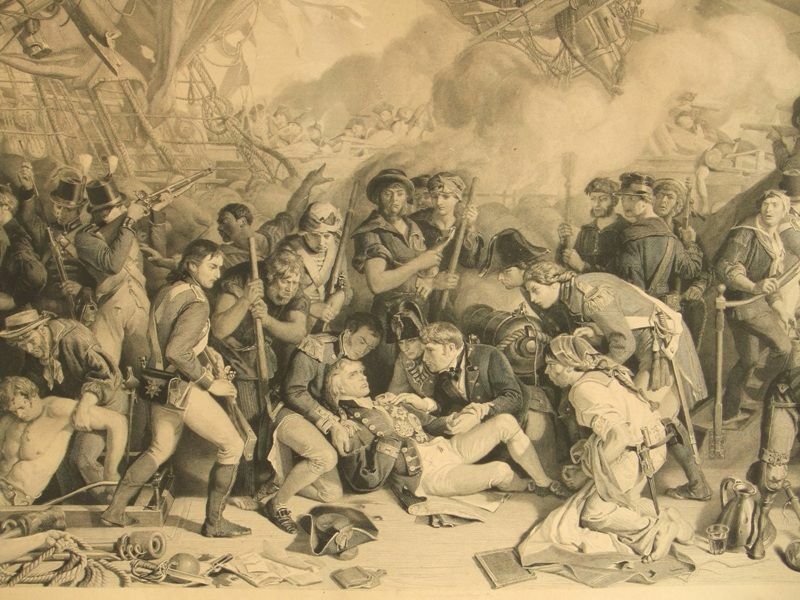 A superbly detailed original engraving depicting the scene from the Battle of Trafalgar on October 21, 1805 during the Napoleonic wars in which Lord Nelson is seen surrounded by fellow soldiers moments before his death, with battle raging in the distance and fallen soldiers all around. 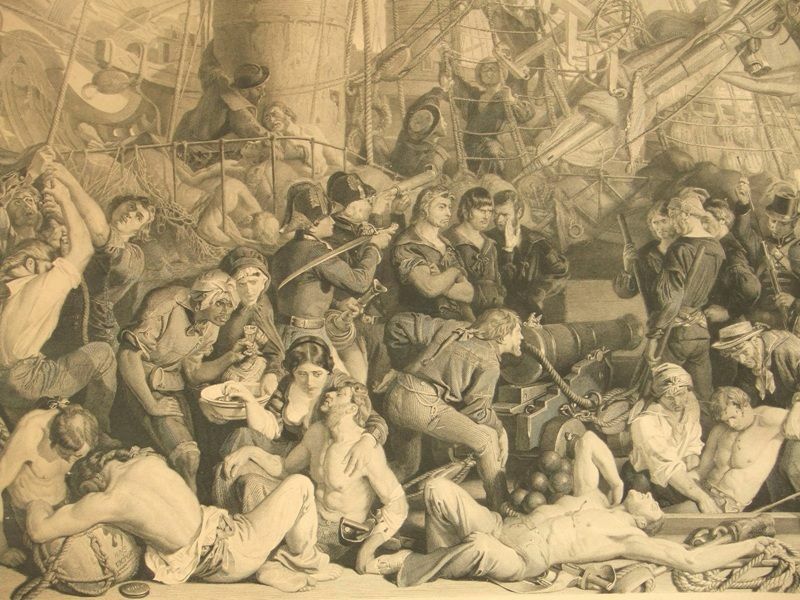 Inscribed below image lower center 'The Death of Nelson at the Battle of Trafalgar, from the original wall painting in the Palace of Westminster', lower left 'painted by Daniel Maclise R.A.,' lower right 'Engraved by Chas. W. Sharpe' and lower right of center'Art Union of London 1876'. 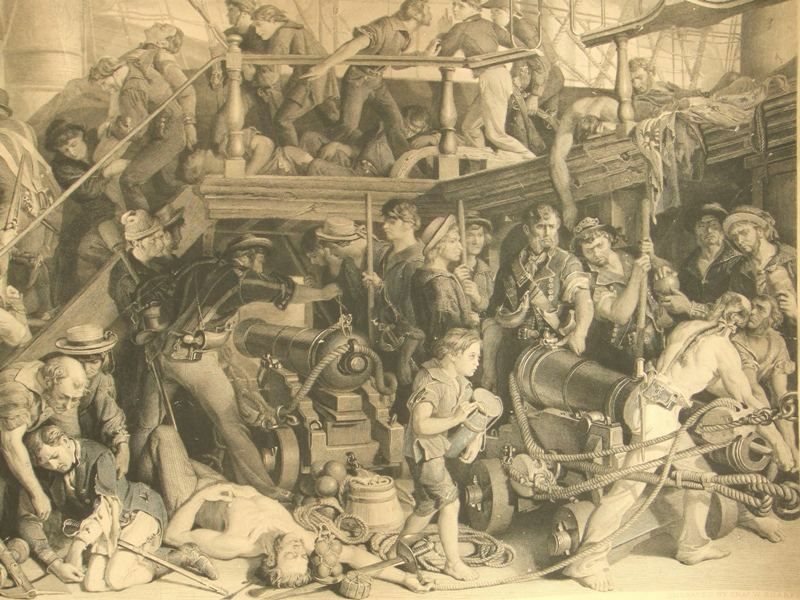 A large engraving which has unfaded, fine black ink lines and textures. The image measuring approximately 115 cms. x 30 cms. (45 x 12 ins) printed within a strong platemark and impression on a wove paper sheet 135 cms. x 54 cms. (53 x 21 ins) laid to original canvas backing. Unmounted and unframed, blank on the reverse, the condition of the image and the sheet is fair with edge wear, several surface scuffs, toning, soiling and handling marks, condusive with age.